THEY ARE not yet finished college. Not all the members are yet in their twenties. 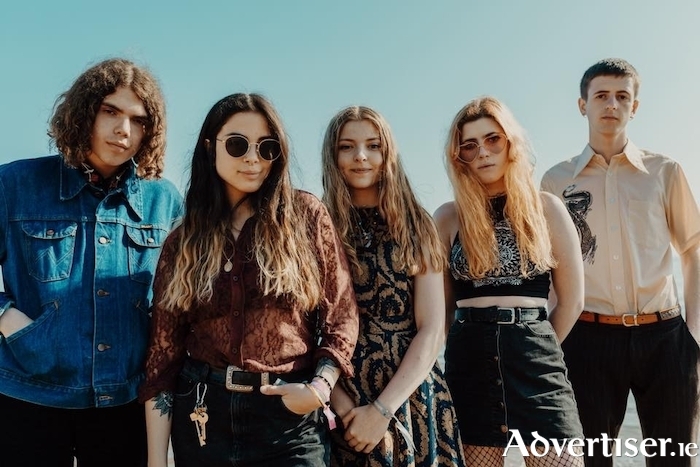 They have only released a few singles and an EP, but Valeras are deservedly regarded as one of Britain's most exciting indie-guitar based bands. Valeras - Rose Yagmur (lead vocals/bass ), Kat Beazley (guitar ), George Parnell (lead guitar ), Katie King (guitar ), Max Sealy (drums ) - are currently on their first headline tour of Britain and Ireland and play the upstairs bar of the Róisín Dubh on Wednesday February 27 at 9pm. “This will be our first time in Ireland,” Rose tells me, during our Tuesday morning interview. The tour has already taken in Brighton, Coventry, Birmingham, Southampton, and a hometown show in Reading ("Every show has been amazing, but Reading takes the trophy,” Rose says, “there were so many people there, singing our songs back to us" ), while tonight is Sheffield, with the tour concluding with the Irish dates (Galway, Dublin, and Derry ). To date, Valeras have released the singles ‘Ricochet (Nunca Morirá )’, ‘Intentions’, ‘Painkiller’, ‘Louder’, and the EP Knives & Flowers. While heavy, guitar driven, indie-rock is at the core of what they do, their music also reveals the influence of Latin America, jazz, R’n’B, and pop - diverse elements the quintet effortlessly fuse. The tour ends 28 days ahead of Britain’s exit from the EU, and for touring British musicians, this is a worrying time, as the threat of a no deal Brexit could result in bands requiring work visas and need to have insurance and driving permits to tour in EU countries. No deal also threatens to result in tariffs being imposed on band merchandise - a main source of revenue for musicians today.